Product Dimensions: 21" back width x 14" total depth. Clears 3" under crossbar. Whether you use your fireplace for heat or just to enjoy the ambience of a fire occasionally, a fireplace grate is a big advantage. This sturdy grate will keep your logs from rolling around on the floor of the fireplace, protecting you and your house. Keeping the logs together also helps to focus the output of the heat. 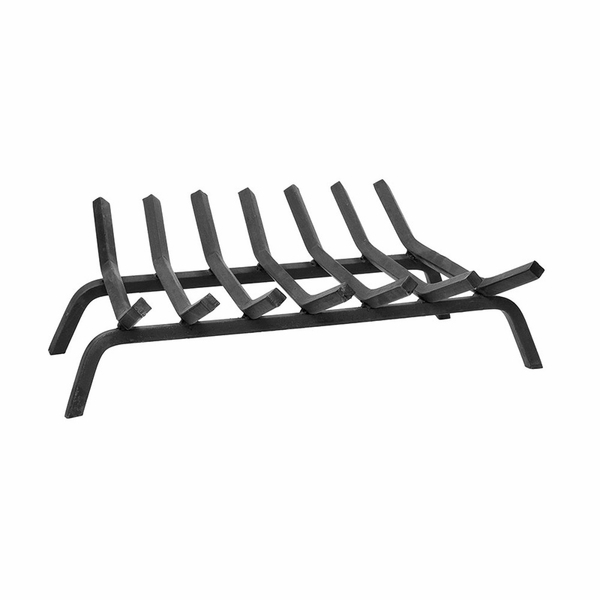 The Minuteman 24-inch Hearth Grate gives a 3-inch clearance under the crossbar increasing airflow to aid in combustion. The resilient black powder finish will protect the 1 1/8" x 3/4" diamond-shaped sections so your grate can be used for many years. Is the measurement stated on the description the width of the Grates or of the Legs? The widths stated for this grate are the legs. Is this grate a 3/4" square bar? This grate utilizes 1 1/8" x 3/4" bar stock. All the parts I ordered came quikly and fit great thank you guy for making my remodel easier. Heavy duty, provides great air flow! Fast and easy ordering and shipping. Great products. Heavier duty construction than other vendors. ProsHeavy duty, provides optimum air flow, fires burn easier and longer. Will never buy this product from any other source. This grate is even better than I had expected it to be! It?s been built to last, which makes it a really good value for the money. I?m sure it will last a really long time too. I?m very happy! Several years back, I purchased this product, but I ended up paying way more than it?s priced here. We use our fireplace all the time, and this product works well all winter long. Our new fireplace grate is exactly what we were needing. It?s the perfect size steel for what we needed, and the two bonus legs provide plenty of added support so that the middle of the grate doesn?t sag down at all. This is a high quality product that I think will last me for many years. I was, however, a bit disappointed when it initially arrived. Online, the company has a different photo listed, and it doesn?t match the product I received. It is still a nice grate, but I was looking for a particular shape to match my accessories. Be aware that you are purchasing a grate with diamond bar stock, not square as shown in the picture. I would still recommend it, especially if the shape doesn?t matter much to you because it does seem well made. This is a pretty decent grate, but if you use it with any sort of frequency, it won?t last. The one I purchased is beginning to warp, and I don?t think it will last longer than this season. Once you see this product, you will be certain how high quality it really is. There?s nothing cheap about it. I?m very happy with it! This product is made of heavy duty bar, and it works great too. It may be a little bit on the high side, but you can cut it off if need be. This is such a nice, heavy duty grate. We?ve been using ours for around two months now in Florida, where the temperature can drop suddenly. This grate doesn?t sag at all, and it doesn?t show any signs of use other than some of the paint that?s peeled off from the higher heat. I love the draft help it provides, which our older grate did not. It really gets the fires going easily. It?s a very high quality grate, and we are extremely pleased with how ours is working so far. I would recommend this to anyone in need of a grate upgrade. So far we've only been able to use this grate a couple of times, but it seems like it will really hold up well. 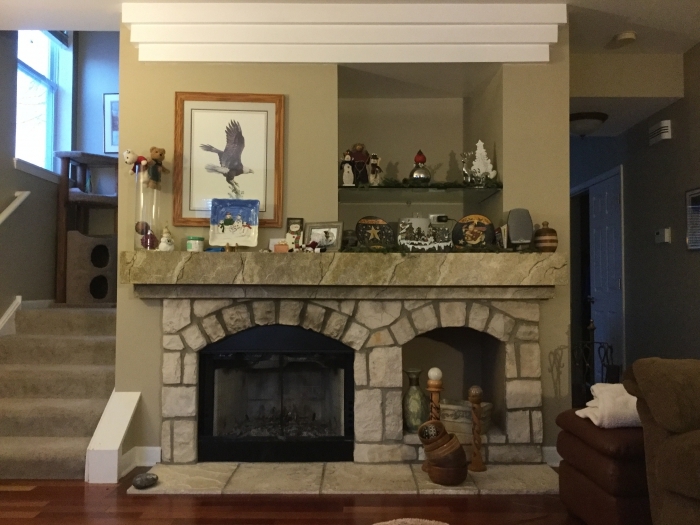 I have been looking for a larger fireplace grate for my larger than average fireplace. This one has an awesome price, and it?s just the right size. Originally, I had concerns that this wouldn't be strong enough to last for very long, but boy, was I wrong! It's really sturdy and fits perfectly in our fireplace. My new grate was delivered very quickly, and I used it almost at once in our outside fireplace, and it worked wonderfully. The fire started very quickly and easily due to the ample air flow that was allowed. I would definitely suggest this grate to those in need of a premium quality fireplace grate, because it does what they say it will, and looks great while not in use. My wife and I could not be more satisfied with this product. We recommend it highly, and believe that it will last us for many years to come. My grate arrived at my home extremely fast, but unfortunately, it is not what was pictured online. The bars on mine are diamond shaped, and the ones online are square. This product features an amazing design. It?s heavy duty, durable, and very sturdy too. This grate is a wonderful buy that I would definitely recommend. Nice New Grate Works GREAT! I recently purchased a new fireplace that came with an insert. The grate that was included was a very poorly made grate, which didn?t allow for any air movement whatsoever. I spent a lot of money on this fireplace, so I figured I would be getting something a lot better. That?s when I purchased this grate, and I?ve got to say that so far, I?m extremely happy with it. It works well, seems very sturdy, and looks really nice too. I would recommend this grate to others. This product is not as large or curvy as I thought it would be initially, but it does work nicely. I would say that it?s worth the investment.